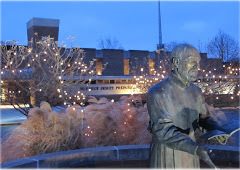 As of Friday, November 6th, the last piece of lighting was installed and the Information Commons is officially complete. 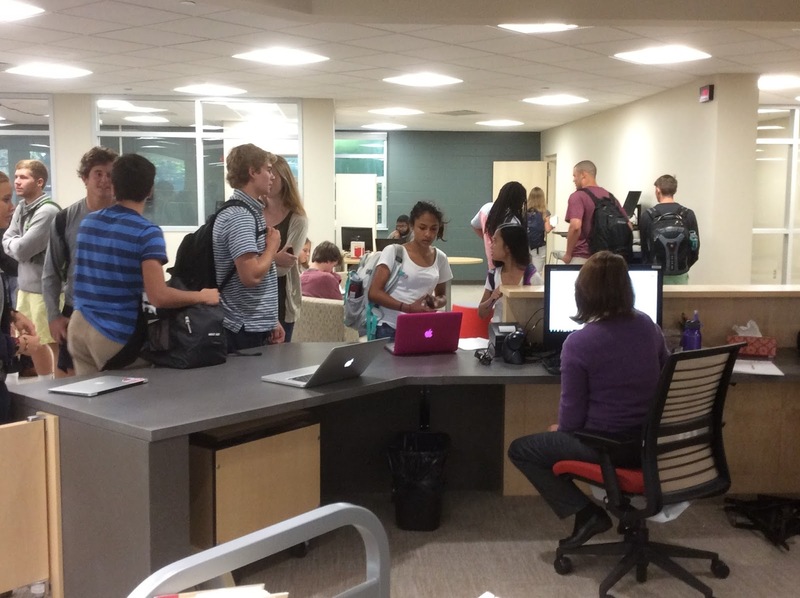 Students, faculty, alumni and families have been enjoying the space since we opened in late August. Rather than bore you readers with the details of incomplete cabinetry, back-ordered furniture and misspelled wall art… I thought I would frame this post in light of the happy surprises this project has created. Zoning works! We planned our space in light of retail design theory which calls for loud spaces up front with spaces becoming quieter and more personal as the user moves deeper into the space. So our collaborative tables are near the door, small group tables are nestled within the shelving and personal seating is furthest back near the windows. Adult presence is most dense in the front of the space – IT Helpdesk and 360 degree reference desk included. Our surprise lies in the student understanding of zoning. Our librarians were very intentional in explaining (during class visits, opening tours and continued supervision) the rationale for the zones, purposes and expectations. Students immediate react with “Oh, that makes sense!” and use the zones appropriately. Now our physical space reflects our academic learning objective that “students will assess their learning need – evaluate resources available – use the resources appropriately”. Sound proof glass to create the quiet study room works! We chose to glass off the quietest section of the Information Commons. This created a physical and mental transition from the chattier areas of the space. Our surveys indicated 48% of the students still required a classic, quiet study space. The happy surprise has been that students completely own this space. No adult has yet to need to monitor the space… the students monitor and respect the purpose. Personal ownership is key to our success. 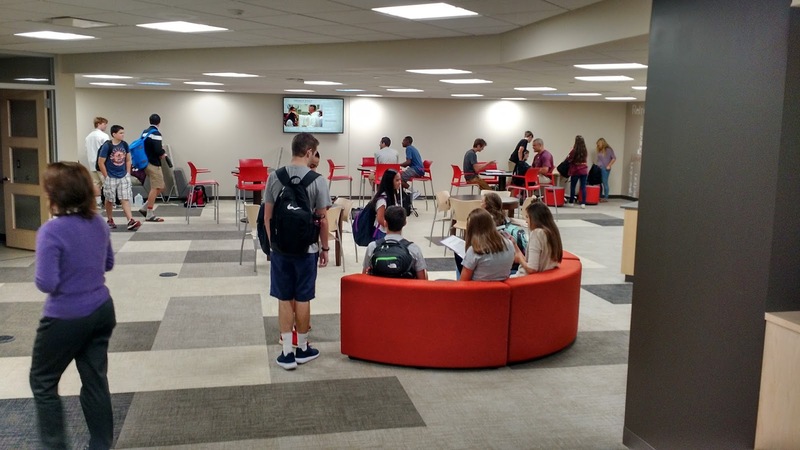 Students like to create their own spaces… and will move furniture around appropriately to create great spaces. We put almost every piece of furniture on wheels. As students live in the space, we all recognize what works and what doesn’t. Students have great ideas on how to better create THEIR learning environment. 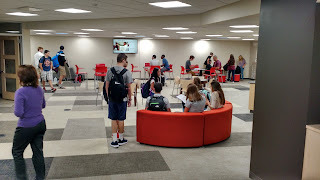 Having flexible furniture allows for the space to grow, meeting student needs. Existing features are highlighted. I can’t tell you how many times people ask me when we put in the skylights. I have to answer “Ummmm 1986." The windows and skylights have been in the space for over 30 years… yet prior physical layout, dark paint and walls obscured these features. By opening the space and brightening the paint and carpet the existing features really pop. As we enter the dark days of winter, the Information Commons is now the most popular space in the building in part because of its wonderful lighting. Oh - and recently JD and I presented at the Treasure Mountain Research Retreat at The Ohio State University. We talked a lot about allowing for student voice in design. If you are interested in seeing those slides just follow the hyperlink.